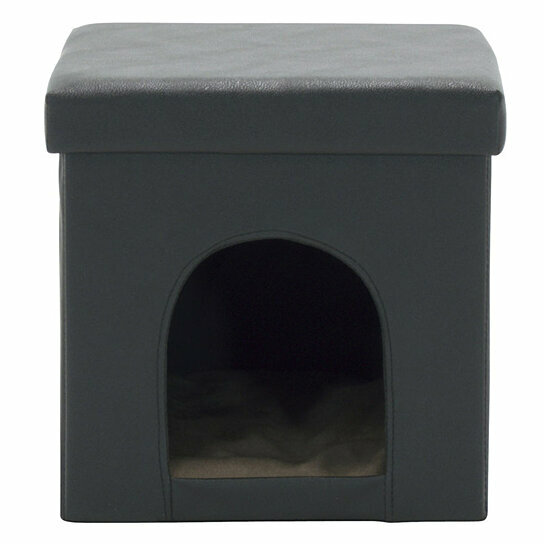 The Collapsible Pet Bed and Ottoman offers an attractive and cozy hideaway for your pet. Since the construction of the ottoman folds / unfolds in seconds, it is easy to transport so your pet can feel at home anywhere. The vinyl exterior and micro suede pillow are easy to clean. The removable top allows you access to clean inside. The color and design of this piece will seamlessly complement your home�s d�cor. Available in Black (Item # 61000) Brown (Item # 61001) and Grey (Item # 61002). Available Color Variations: Black, Brown, Grey. Shipping Weight:8 lbs., Shipping Dimensions:16"L x 16"W x 3"H Carton Weight:8 lbs.,Carton Dimensions:15.5"L x 16"W x 3"H.